The use of this form saves time as it is quick and easy to complete and can be printed and even emailed to the Health Department. 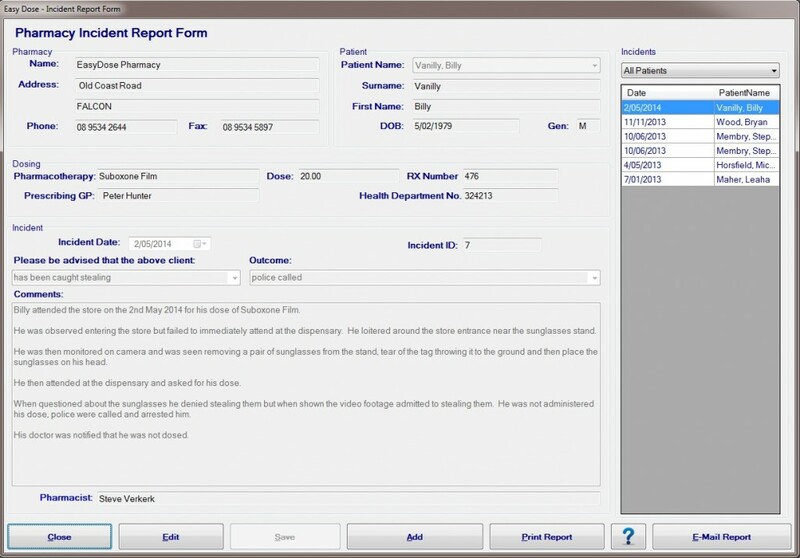 It can be accessed from the Main Menu > Incident Report, the Patient Form or the Dose Patient Form. Incidents fall into the following categories and should be submitted in any of the following circumstances. Records can be added, viewed, edited, printed or emailed. The list on the right shows the number of entries along with the patient’s name and the date of the incident. To view a record, click on the appropriate entry in the list on the right side of the form. The form will display the record which can be edited and saved. When the form is opened from the Patient Form or the Dose Patient Form, the reports applicable to that patient only are displayed. An Incident Report can be added from this form when it is open in read mode. Click Add will unlock the form allowing the patient name to be selected from the drop down list. Selecting the name will populate the patient details, their dosing details along with the doctor details. The pharmacy name will populate along with the name of the currently logged on pharmacist. 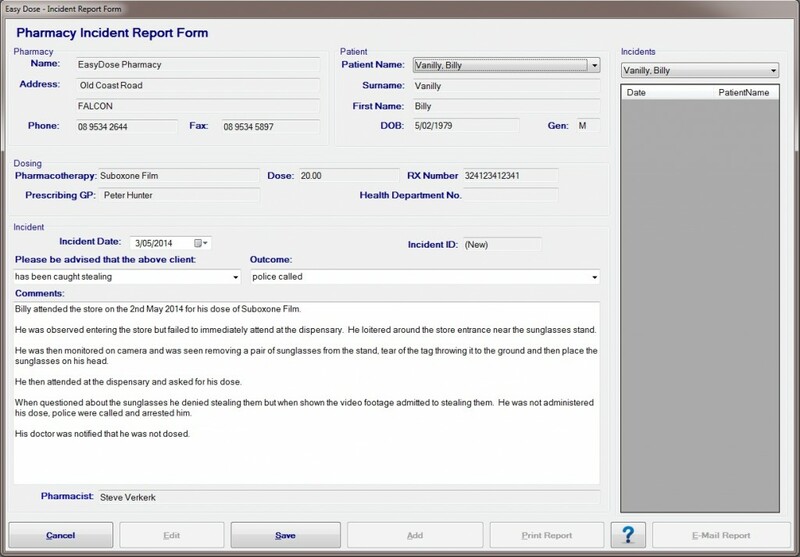 Incident Reports can be added from the Main Menu > Incident Reports or the Incident Report buttons on the Patient form or the Dosing form. Click the question mark will bring the operator to this webpage. 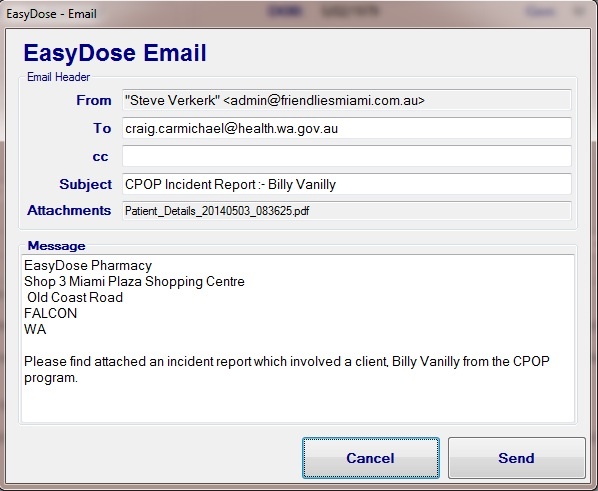 An Incident Report can be printed but more importantly can be emailed direct to the Health Department to an email address previously entered in the System Option form. This email address must be populated with a valid email address. When clicking “E-Mail Report” the following form opens, fully populated with the report attached in PDF format. No further text needs to be added to the email unless desired by the pharmacist. A copy of the report will be emailed back to the store to verify the email has been sent.